Kitchens have become the social and functional hub of the house, where we visit with friends, feed our children, pay bills, and of course, cook - it is the epicenter of family life. With that in mind, a new, enlarged kitchen was the catalyst for this contemporary remodel. The new kitchen was completely reconfigured and expanded to incorporate what had been a cramped eating area. 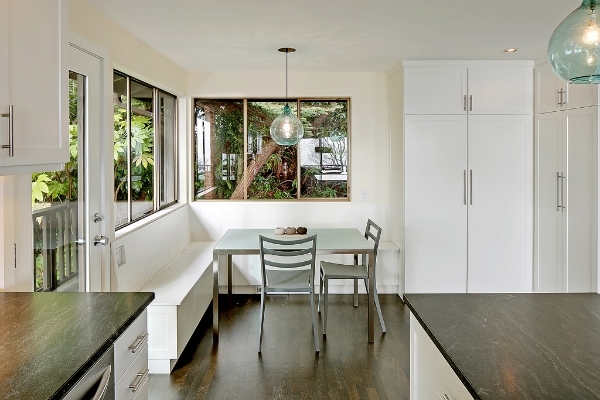 A casual built-in breakfast nook anchors one end, and an island peninsula at the other end. Walls were removed between the kitchen, dining, and living rooms, providing views and allowing natural light into the kitchen. The materials are a contemporary contrast of clean "lights" and rich "darks" with white cabinets and glass tiled backsplash playing against deeply figured quartzite counters and richly stained oak floors.